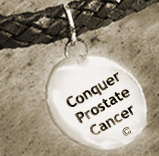 Conquer Prostate Cancer Now: Prostate Cancer PSA, Hurray! Yesterday I happened to have glanced at the February 5th edition of the Prostate Cancer Treatment Report. It addressed a study on the value of the PC3 test for determining if a man might have prostate cancer. Here's my response to that report: The PSA test cannot by itself determine prostate cancer. It only indicates the possibility of prostate cancer or its recurrence, subject to further testing such as a biopsy. For this reason, any enhancement of the PSA test, which is unreliable but still the best initial test we have, would be welcomed. I agree that the PCA3 is a helpful supplement to the current PSA test, but other tests that make use of additional biomarkers have already been developed in the laboratory. Once developed and tested with humans, we can only hope the new tests will provide greater accuracy in pinpointing whether a man has prostate cancer or not.